Patients are being harmed because drug shortages are forcing doctors to change their prescriptions, a survey has revealed. One in seven GPs say their patients have experienced negative side effects after they had to switch to second-choice drugs. Shortages of medicines have this year been described as ‘worse than ever’ and there are concerns Brexit is contributing by causing patients and companies to stockpile. More than a third of doctors say they ‘fairly often’ have to switch to less desirable drugs because of availability, while 16 per cent say they have to do it ‘very often’. In a survey of 586 GPs by the news website GP Online, nine out of 10 of them said they noticed their go-to medicines were becoming unavailable more often. Figures last month revealed the Government was in December paying over the odds for 80 drugs because they were hard to get hold of – this has dropped to 61 so far for February. ‘Shortages do affect patient management tremendously as second line medications are not always ideal and in rare cases not as effective,’ said one anonymous GP in the survey. Another said anti-inflammatory painkillers, such as ibuprofen, high-strenght aspirin and naproxen, pose a particular problem. And one said it was ‘terrifying’ to think about what might happen ‘if Brexit goes ahead’. There have been concerns patients will try to stash medicines out of fear they won’t be able to get prescriptions filled if Britain leaves the EU next month. NHS hospitals could be landed with the bill for transporting vital cancer treatments into the UK from Europe after Brexit, the Royal College of Radiologists has suggested. The organisation fears a possible increase in the cost of air travel, triggered by the breakdown of international customs arrangements, could be passed onto hospitals. In particular, it is concerned about radioactive isotopes which are vital for diagnostics and treating cancers with radiotherapy, the Health Service Journal reports. The products decay too quickly to be stockpiled, the experts warned, and must be delivered to hospitals early in the morning. If this couldn’t be carried on as normal, the hospitals would have to restrict how much they can use or pay over the odds to access the materials, they speculated. 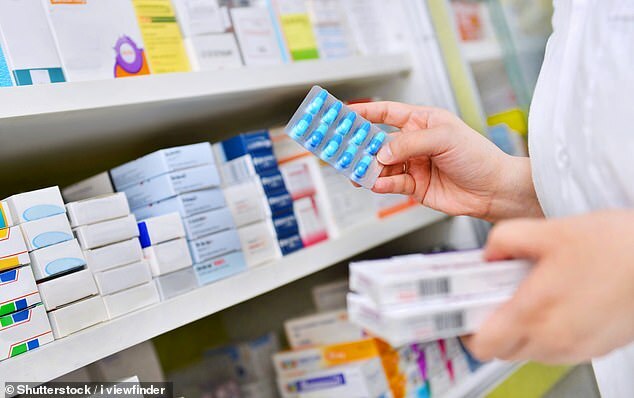 International supply lines may also be disrupted if there are no agreements put in place before Brexit – even the Dutch government has admitted it is trying to secure access to ‘vital’ medicines out of fear European supplies will dry up. And the country’s health minister, Bruno Bruins, said he wouldn’t reveal which medicines they were concerned about in case other countries tried to take them. There has been disagreement over whether Brexit is the real cause, and the Government denies the link. In January, chair of the English Pharmacy Board at the Royal Pharmaceutical Society, Sandra Gidley, said: ‘This has been a problem for some time. And Martin Sawer, executive director of the Healthcare Distribution Association, said people might be stockpiling medicines. The Government has this month passed rules on ‘serious shortage protocols’, which will allow pharmacists to give a patient drugs different to what is on their prescription if supplies run out. A Department of Health and Social Care spokesperson told GP Online: ‘There is no hard evidence to date to suggest current medicine supply issues are increasing as a result of EU exit. ‘Our number one priority is to ensure the continued supply of medicines and we are working closely with industry and partners in the health system to help prevent disruption, including increasing UK buffer stocks. ‘We are confident that, if everyone does what they need to do, the supply of medicines should be uninterrupted in the event of a no deal.